A man has been arrested on suspicion of child neglect after a person allegedly attempted to sell a baby to a stranger at a Manchester shopping arcade. 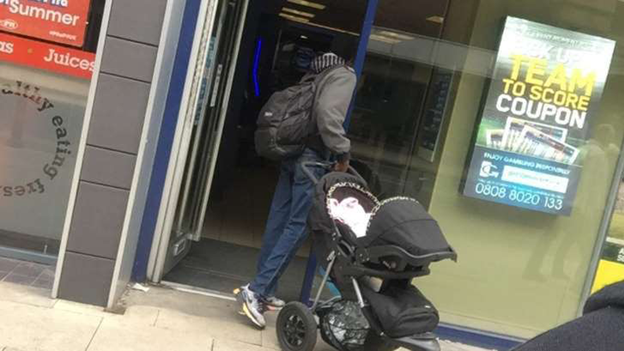 The man was reported to be pushing a pram and approached another man, offering to sell the three-month-old baby boy, police said. It was said to have happened in Barton Arcade in the city centre shortly after 2.30pm on Sunday. Police said the child is safe and a 28-year-old man is in custody. Detective Inspector Liam Boden said: "We would like to thank members of the public and the media for their assistance in publicising the appeal earlier today. "We have now arrested a man on suspicion of child neglect and will be questioning him in relation to the incident as we try to establish the full circumstances."